I've been tinkering around the net lately and found dozen of photos of counterfeits. The most notable to me are the Chinese-based counterfeits being produced in very large amounts. As you can imagine these range from crude junk to very deceptive recreations. Ebay is a large venue for these coins and are sold as a replica/copy. All the dealers claim to have their coins stamped as such so they can be sold and imported into the US. Obviously the stamping occurs after the initial strike from the set of dies. I will give them this much at least, most sell them as replicas and have them stamped so no one can pass them as the real thing. To me this is fine and dandy and just like any other replica coin company. However, the people who sell the ones without a stamp are giving criminals a chance to pass a counterfeit off as a legitimate coin, and I don't condone that. A novice could easily be out hundreds of dollars because of this. I've also seen counterfeiting work of a lesser scale from all over the world and a vast amount of contemporary counterfeits. 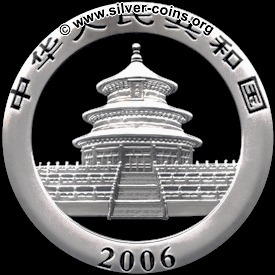 I think it would be a good idea to post some photos of counterfeits and "replica" coins to use as a reference guide. I will do my best to point out details from the photos I post to use as die markers in an attempt to help educate everyone best I can. 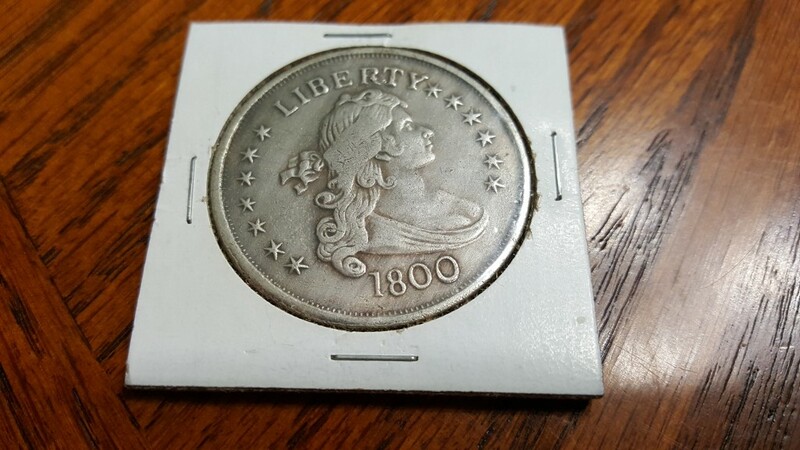 If you collect counterfeits, honestly I feel you are welcome to them, but I would hate to be the one who paid lots of money for a coin that turns out to be a fake. I would also like to enlist everyone else who has a photo or has found a photo of a coin I did not cover. Here are a few things I've noticed so far. 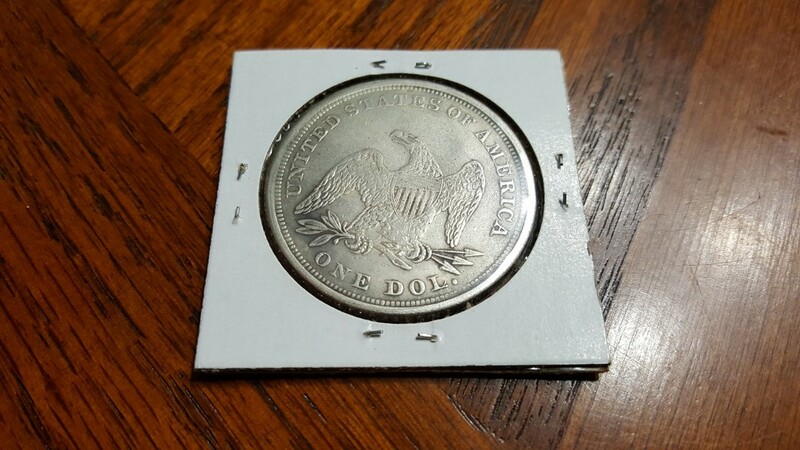 (All photos are of copies/replicas/counterfeits and are from the internet, most from eBay) These die markers are on every coin I've seen, both reeded and lettered edge. This doesn't mean these are the only dies they use, just the most commonly sold ones on the internet. All the draped bust small eagle copies of this die set(1795-1797) have an extra curl of hair near the date. Also note that these appear to be struck within a collar which wasn't introduced until something like the 1830's. The denticles should go all the way to the edge, but form a rim instead. 1795 Has an additional die blob at the end of the circled star. Rim seems too perfectly lettered and doesn't appear to be deep enough into coins surface. Here are some counterfeit die variations of trade dollars I've spotted. They use what appears to be different dies for each obverse but I've noticed only a few variations within the reverse dies. Most of these may be the same die that has been retooled or something, but I've noted a few things that standout. S mint with a die clash behind the S. It appears to be a draped bust die, not a trade dollar die from the shape of the clashing. I wonder if the mixed them up and then realized it and quickly removed the coin blank, resulting in the clashed die. No clue. Great info, Vfox -- thanks a lot! Wasn't there something about the eagle's eye that is different on the genuine vs. the usual counterfeits? I remember reading about it on one of the other coin newsgroups (rec.collecting.coins, probably) but have no idea where that information came from, and I can't remember the details. Yes! very good stuff! think we need to pin this thread? I'm not sure. I'd also hope that this is a useful guide to anyone looking to purchase any of these coins, so if it gets stickied I'd be happy. I have many more images I'm looking through as well, so expect more soon. Here is a shot of a legit trade dollar for comparison. Haha, I wish, it's just a photo I found online. Mine in my omnicoin is like a F+ or so. Okay, here are some more photos I've looked through and found die markers for. These are generally poorly made fakes, except the two seated dollars, which are very well made, but show a generally weak strike overall. 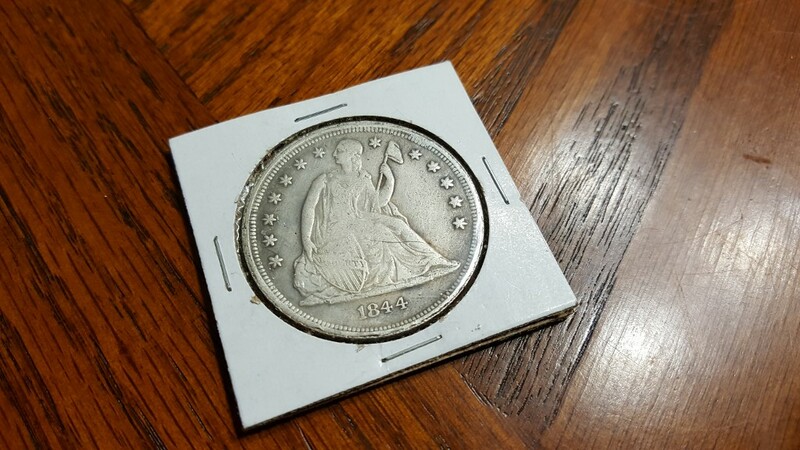 There is nothing wrong with buying old coins from ebay, you just have to be very careful. And remember you can always ask us about an auction before you bid and we can give you our opinions. This photo reference is intended to help people figure out what coin is legit and what coin is counterfeit over the internet. In hand most of these coins just look "off" but online they look really good. ...you can always ask us about an auction before you bid and we can give you our opinions. I'd like to second what Vfox said, but have added bold emphasis to his words. Some people here have apparently bid on an item, won the auction, then try to refuse payment based on what they learned here on the forum AFTER they had already won the auction! Needless to say, this isn't fair, neither to us nor to the buyer or seller. I just wanted to give this a bump to the front as well as add a note regarding new Chinese counterfeits. Currently EVERY and I mean EVERY SINGLE COIN ever minted by the US mint as a regular issue (This includes silver eagles) is currently being counterfeited. This starts with the 1792 issues and includes every regular coin from the half cent to the $20 gold coins. I am going to use this post as a reference for the US issued counterfeit coins, but the task is monumental, there is no way for me to possibly list every coin and find die markers on each item. This is where you, my fellow CPer's come in. 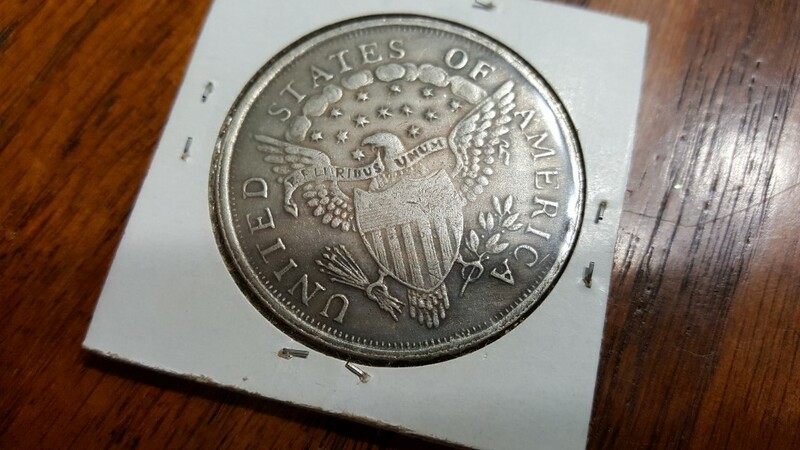 I implore everyone on here to email me any US issue counterfeit (decent sized/resolution) image of counterfeit US coins, new or old, at Shadowfox23@hotmail.com. I cannot do this alone, but I will try my best to compile a worthwhile image bank and description list for each counterfeit US coin discovered. I have an image folder of over 200 images so far and I will be updating them on here as I complete their analysis over the summer. But as said, there are many more, and I encourage your help! Interests:My wife, Coins, arts & crafts, sitting on a rock up in the mountains enjoying God's creation and thinking of nothing. Thank you for spending all that time collecting and posting this info! It is most worthwhile. I think bumping this might be worthwhile to the newer members. I'd also like to try and restart this effort. My computer has been dead for a year but my phone should be able to handle the work. Hopefully. Haha. You have helped me a tremendous amount & I have learned a lot of valuable information here. I want to say thanks for making the effort you have in putting this counterfeit section up as it has taught me a lot & I know some of the signs to look out for. I was recently offered these coins. Prior to making the drive to check them out in person, I would like to know your thoughts. They look fake to me but would not want to pass up on them. What do you think? Real or fakes? Thanks for your help!! Sorry for the delay in response. I do not like the look of those coins. I am no expert but they do not pass my eye test. The fact that you have to ask yourself if they are real is a good sign they probably aren't. I'm with DP here, those are not legitimate. The draped bust is the easiest to identify as counterfeit but both certainly are. I bought a new PC after like 5 years of not having one so I should be around more often. I don't do forums on my phone, none of them run correctly, lol. That's a good thing. I'll be glad to see you around more, it's always nice.